Overview: Peter Parker is pushed to his limit physically and emotionally in this volume. And when Peter is at his breaking point, the Amazing Spider-Man is at his best. As if battling Doctor Octopus, the Hulk, and Dracula was not enough, Spider-Man faces down the Green Goblin, who kidnapped and killed Peter’s girlfriend, Gwen Stacy. Spider-Man fights Norman Osborn for what we think will be the final time, as the Green Goblin is accidentally killed by his own goblin glider. Of course, that still does not stop J. Jonah Jameson from accusing Spider-Man of murder. Spider-Man meets up with a new set of heroes that represents the spirit of the 1970s. Hero for hire Luke Cage is retained by Jameson to bring in Spider-Man dead or alive. The Punisher places Spidey in his targets after reading one too many Daily Bugle editorials about the supposed crimes of our star. Finally, Spider-Man teams up with Shang-Chi, the Master of Kung-Fu, who uses his martial arts skills to thwart the mad schemes of his father. This volume ends with the debut of a new Green Goblin, who is seeking revenge on Spider-Man for the death of his predecessor. Spidey quickly realizes that this new Goblin is one of his best friends, Harry Osborn, creating a whole new set of problems for Peter. What makes this Essential? : This should be a must own for many reasons. For character introductions, we meet the Man-Wolf, the Jackal, the Tarantula, and, perhaps most importantly, the Punisher. Even though he was exaggerated to comic proportions, the mission of Frank Castle could easily be replicated in real life. At the same time, we witness the most tragic event in Peter Parker’s life since the murder of his Uncle Ben. The death of Gwen Stacy came with no warning, no lead-up, no spoilers. It changed Peter, and it changed the tone of the book. My feeling is that between the death of Gwen Stacy and the introduction of the Punisher, Marvel left the Silver Age of comics and entered the Bronze Age. These stories should be part of any collection. Not only is he Amazing, he’s Spectacular: In 1968, Marvel entered into the magazine business when they partnered with Warren Publishing to issue a Spectacular Spider-Man magazine. Warren was known for their horror magazines at this time. Spectacular Spider-Man was a black-and-white magazine which featured new original stories from Stan Lee, John Romita, Sr., and Jim Mooney. 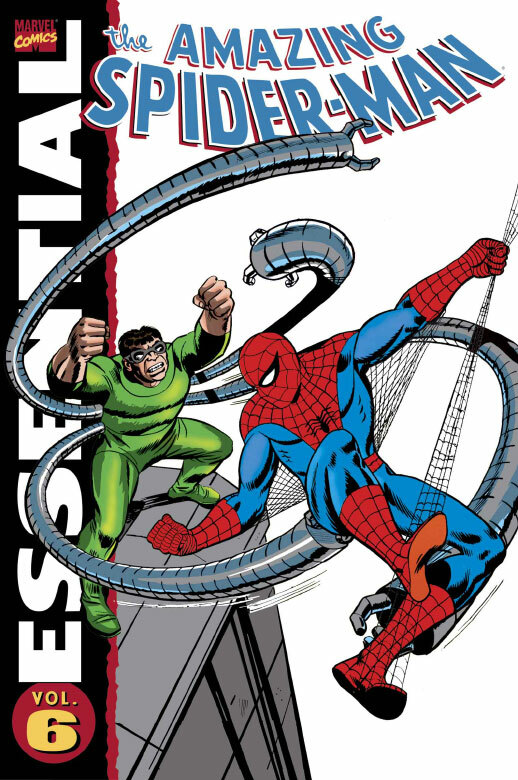 The lead story of Spectacular Spider-Man #1 was broken up and re-used for Amazing Spider-Man #116-118, which is collected in this Essential. The lead story for Spectacular Spider-Man #2 was edited and re-used in Amazing Spider-Man Annual #9. The magazine experiment ended with issue #2. However, in the 1970s, Marvel got back into the magazine business with their then owner Curtis Publishing. Curtis helped distribute a wide range of black-and-white horror magazines with content that might not have passed the Comics Code Authority at that time. Footnotes: In Amazing Spider-Man #130 (March 1974), the infamous Spider-Mobile makes its debut. According to interviews with Gerry Conway, a toy executive had approached Stan Lee and suggested that all of the characters should have some kind of vehicle to use. Lee readily agreed, knowing that he wouldn’t actually have to write the story. When Conway pointed out the flaws in the idea, Lee said he didn’t care what Conway did with the car once it was introduced. As a result, the Spider-Mobile soon ended up at the bottom of the Hudson River. Despite that, Spider-Mobiles can still be found included in nearly every line of Spider-Man toys since then. Amazing Spider-Man #129, #134, and #135 were also reprinted in Essential Punisher Vol. 1. If you like this volume, try: going back and looking for the Marvel Masterworks Spider-Man Vol. 7, available as both a hardcover and as a trade paperback. What makes this volume important is that it contains the two Spectacular Spider-Man magazines complete and unedited. Outside of owning the physical magazines, this is the only way to read Spectacular Spider-Man #2, as it has never been reprinted completely in any other fashion. This entry was posted in Marvel Essentials, Spider-Man and tagged Gerry Conway, Gil Kane, John Romita Sr., Len Wein, Ross Andru, Spider-Man, Stan Lee. Bookmark the permalink. Pingback: Throwback Thursday – Essential Spider-Man Vol. 6 – WORST. COMIC. PODCAST. EVER!